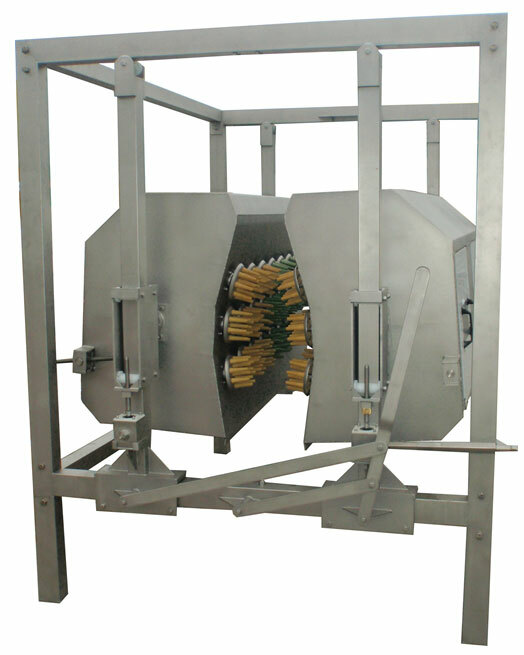 The SL-3 in-line “box” plucker is designed for defeathering all types of poultry. Design and operation: The supporting structure and casing are made of stainless, acid-resistant steel. The SL-3 plucker can be equipped with 60, 72 or 96 picking heads, with each head containing 12 rubber fingers (the 60-head version of the SL-3 plucker is referred to as SL-3/60, the 72-head version: SL-3/72, and the 96-head version: SL-3/96). The picking heads are driven with special endless belts, with each row of heads powered by a separate electric motor, placed in a stainless-steel enclosure. The plucker is equipped with hydraulic lifts for adjusting the position of the picking head casings. The position of picking head casings towards the transported carcasses can be adjusted to match the bird size. The SL-3 plucker is designed to co-operate with conveyors and shackles manufactured by PoultryProcessingEquipment.com. If you have conveyors from other manufacturers, please consult our company for adapting the plucker to the existing conveyor. A great benefit of the SL-3 plucker is its compact and simple design, which allows for proper cleaning of the machine and provides easy access to its parts for replacement.